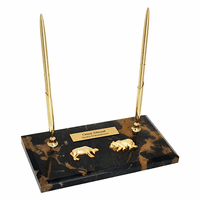 FEATURES/SPECS Our Wall Street theme notepad holder and pen stand is a great gift idea for stock brokers, clerks and traders alike. 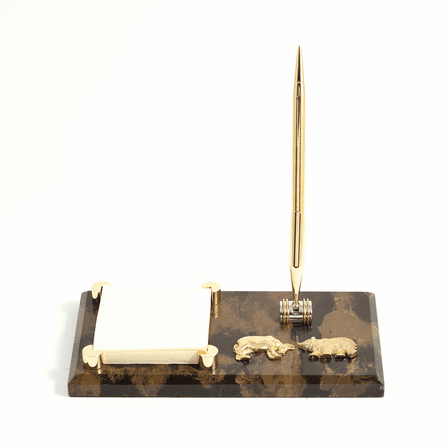 It features a post-it style brass notepad holder and a brass pen stand (pen included) on a black and bronze marble base. 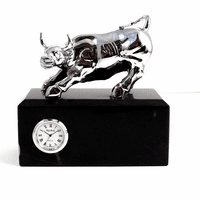 In front of the pen stand are brass emblems of a bull and bear duking it out, the classic symbol of the eternal battle in the marketplace. 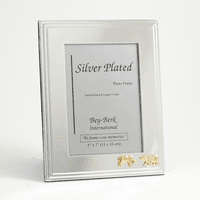 Add a free personalized plate to the front of the base free of charge for a unique gift for the stock broker in your life. Can we place the brass personalized message in place of the emblems? 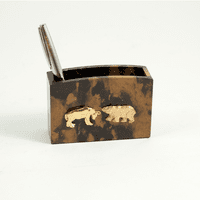 (Instead of the emblems?). Please let me know. Thank you. We're sorry, the emblems come with the desk set.